This week's featured small space is an historic casita in Santa Fe, New Mexico. 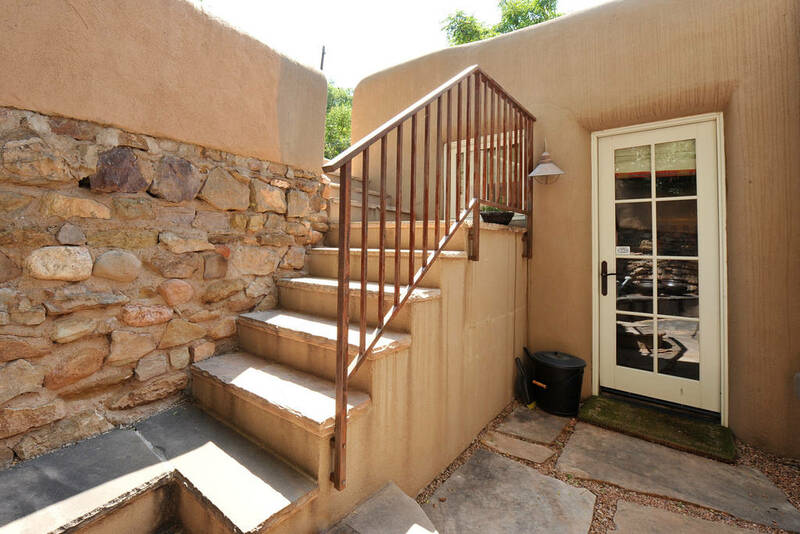 Adobe homes are a style I've long admired. In fact, Dennis and I seriously considered purchasing an adobe in LaVeta, Colorado before we decided to move to Oregon. I don't see very many first-class adobes in the small home category, so when I came across this fetching 120 year-old casita in Santa Fe I was more than a little excited about the possibility of featuring it in my Living Large In Small Spaces series. I'm happy that Jennifer and her husband of over 30 years Kit have allowed me to share it with you. 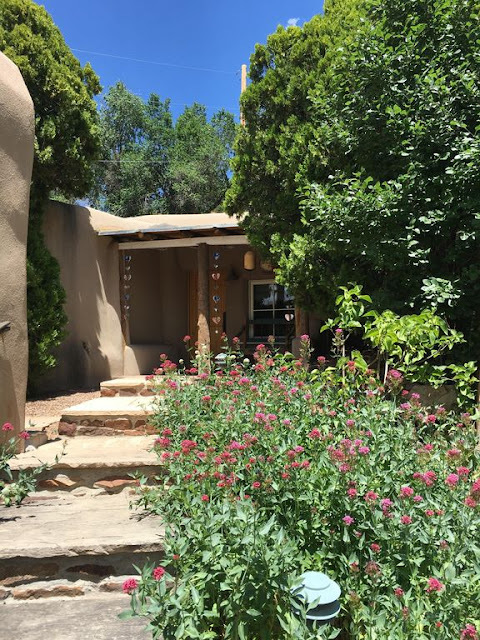 The 1,027 sq ft casita is the former guest house of Sheldon Parsons, first director of the New Mexico Museum of Fine Art in 1918. The adobe was professionally renovated in 2007. It is a retreat from Jennifer and Kit's busy east coast life and also used as a vacation rental. Rugged stone steps lead to the adobe's entrance. 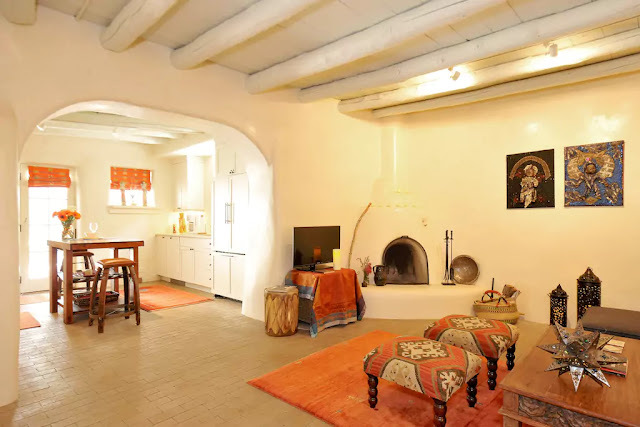 The understated entry boasts a banco (built-in plastered bench) and southwestern style wooden bench. The interior is light and airy. 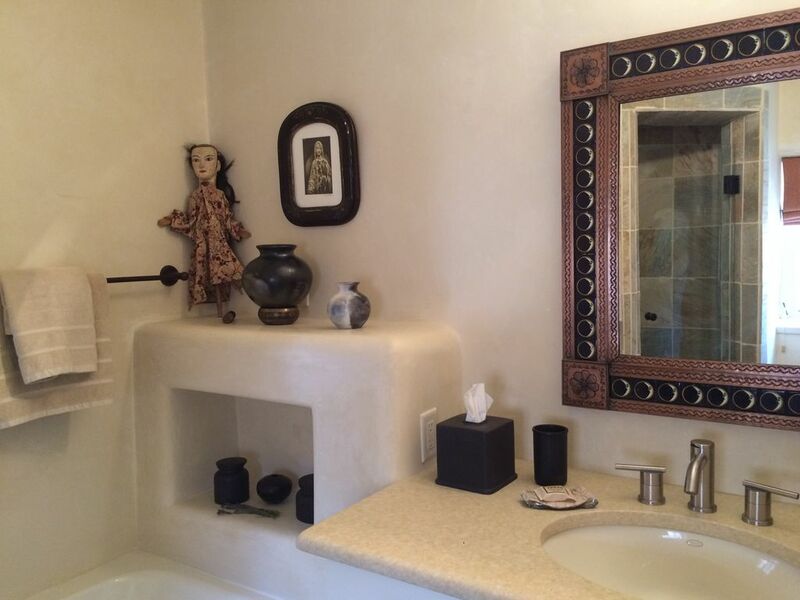 Creamy plaster walls are a lovely backdrop for the eclectic furnishings with their warm desert tones. 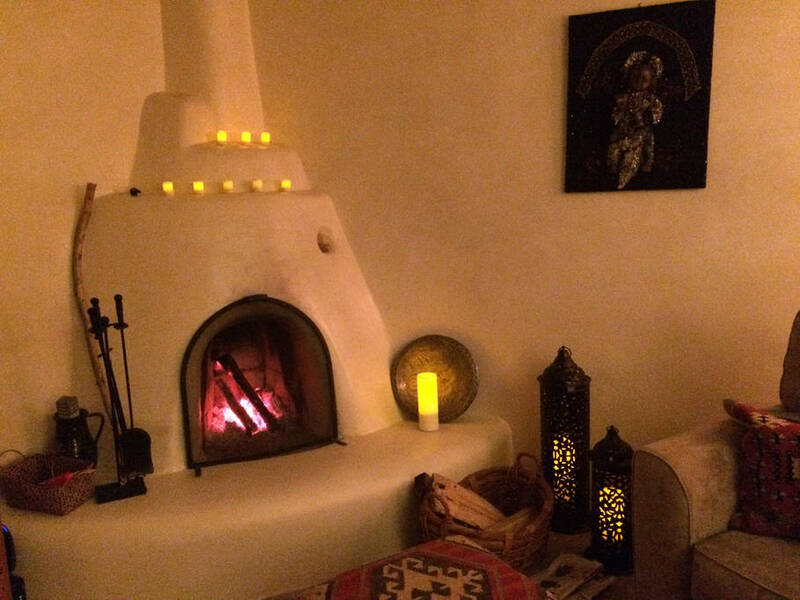 The kiva fireplace is pure southwestern style. Buttressed thick walls and deep window wells are characteristic of adobe homes. 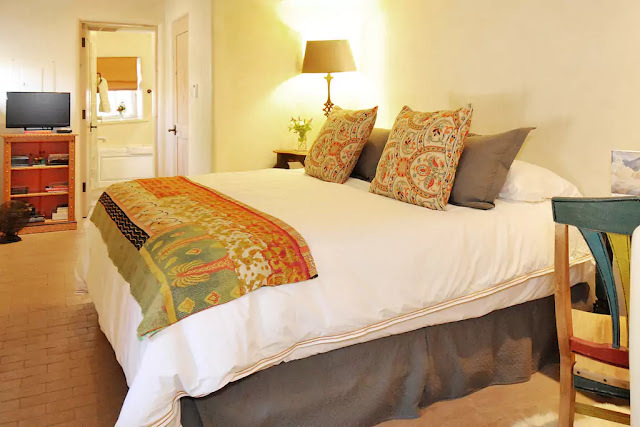 The ceiling and radiant-heated brick floors add wonderful texture to the rooms. 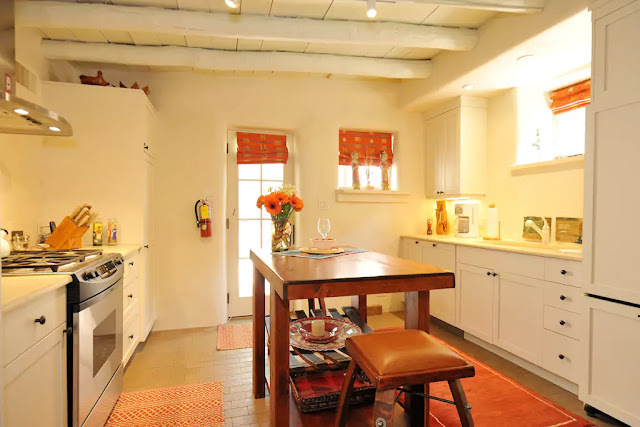 It's refreshing to see an adobe home with a white kitchen, and with the kitchen's openness to the living room the creamy-colored rooms flow together seamlessly. Wood stained cabinetry wouldn't work as well here. 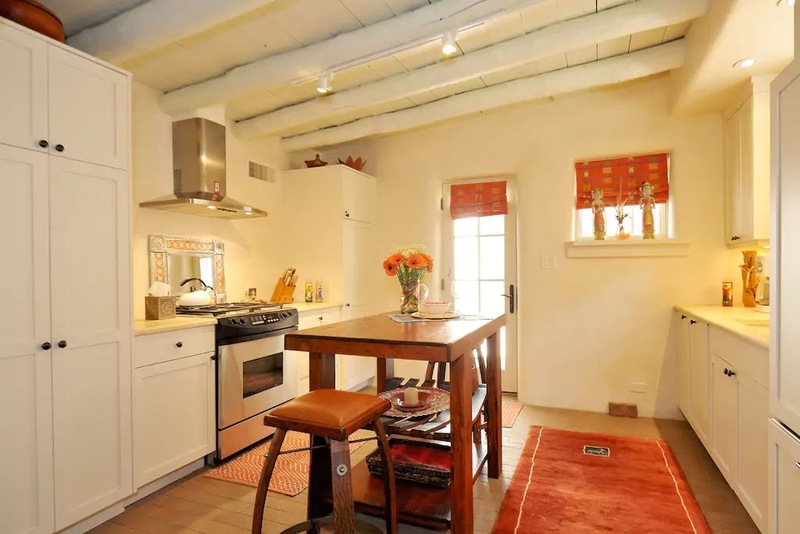 This small home has a roomy cook's kitchen. The island warms up the space and nicely contrasts with the light cabinets. The bedroom has so much character. 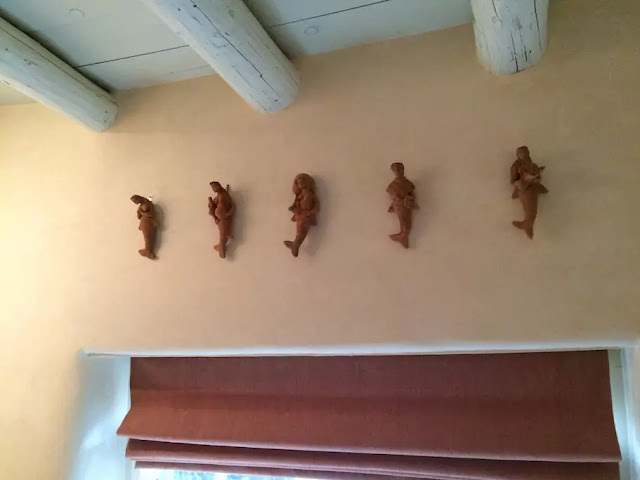 Mexican folk art mermaids dance above the bedroom window. The bedroom has a beautiful en suite spa bath. Every inch of this bathroom has been utilized to the fullest. The little niche is so charming. 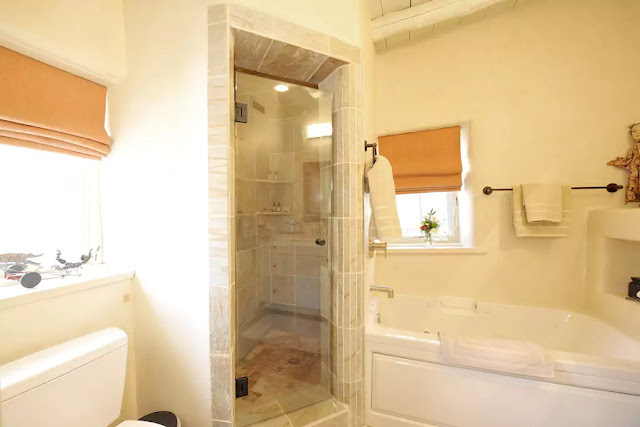 The bathroom has a large tumbled marble faced shower, as well as a jacuzzi tub. A sheltered patio and grilling area is accessed through the kitchen door. There's a lower patio with dining for two. 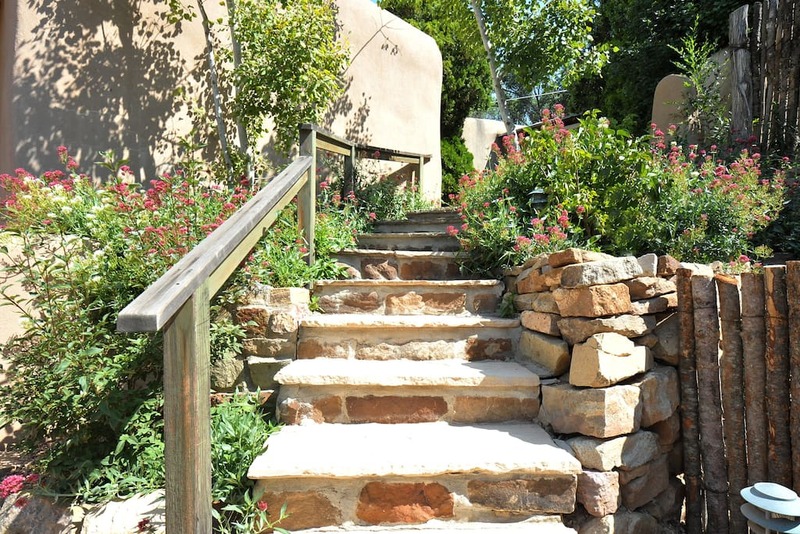 Steps lead to Jennifer and Kit's favorite spot -- the gorgeous hilltop garden. Summer/fall roses grace the staircase to the upper gate. One of two patios in the garden, the upper patio offers hummingbird watching while relaxing to the soothing sounds of the rock fountain. 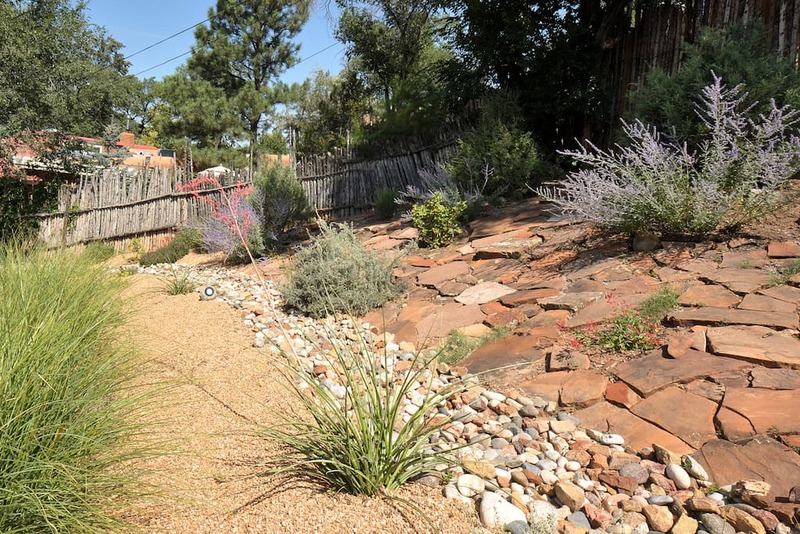 Jennifer says, "We had a vision for the backyard, which was raw earth before we installed a native garden that surprises throughout the year." 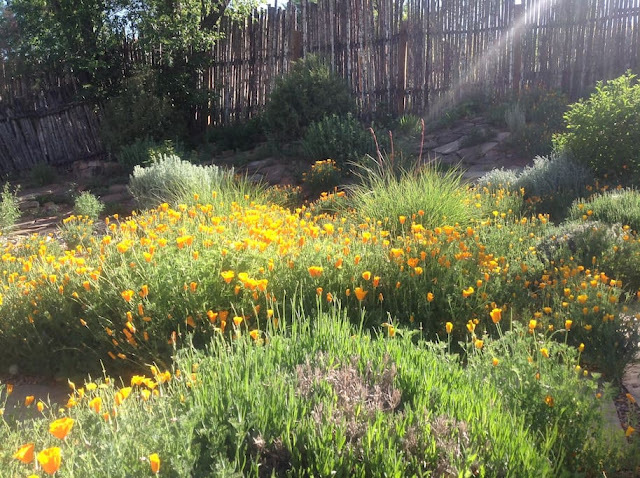 California poppies are "riotous" in June. Another part of the garden in August. 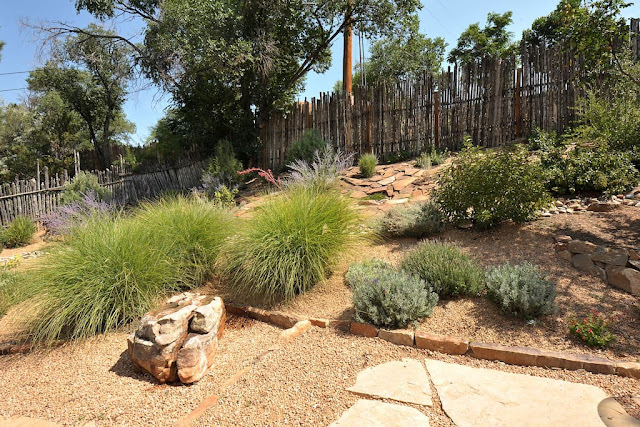 There are over 20 varieties of native plants, bushes and trees in the garden. This lavender is one of five different kinds found there. 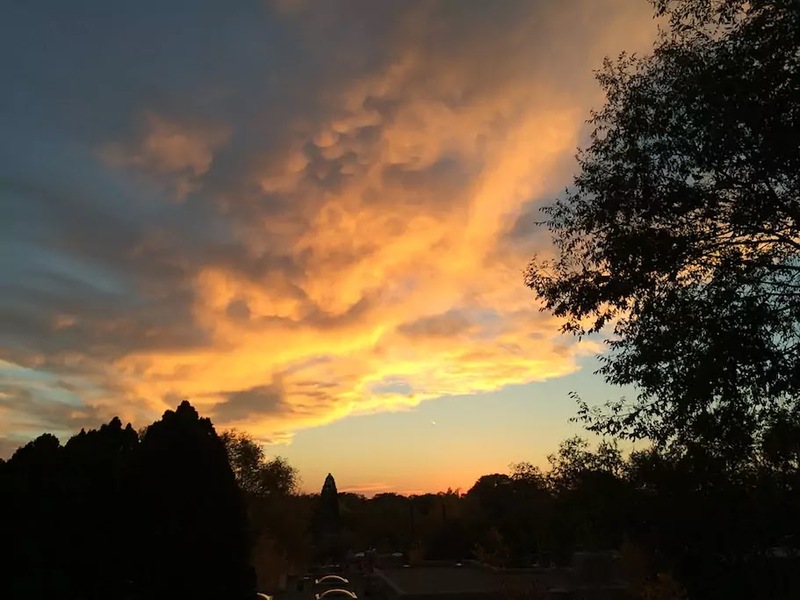 Stunning sunsets are plentiful in New Mexico. This photo was taken from the garden. Jennifer takes a personal interest in seeing that her guests enjoy their stay. As she puts it, "I absolutely adore helping people curate a stay around their interests, especially the arts." 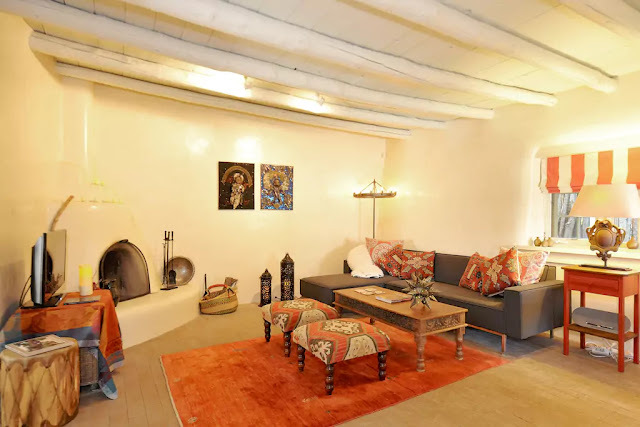 Judging by the guest reviews on their web site, I'd say Jennifer and Kit have created an enchanting retreat not only for themselves, but for anyone who's lucky enough to stay in their captivating Santa Fe adobe. 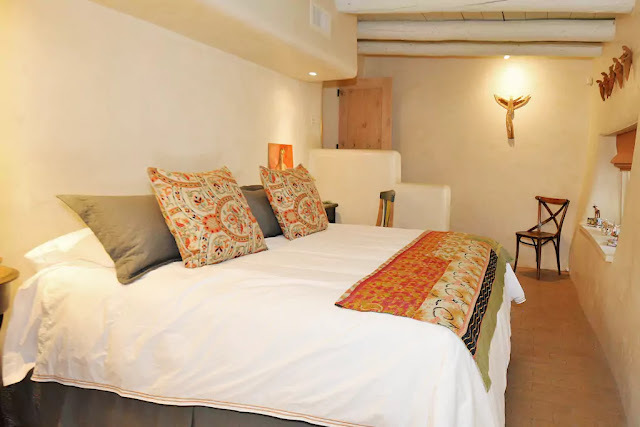 For more information and reservations visit The Casita at Cerro Gordo website here. I loved seeing this adobe home. 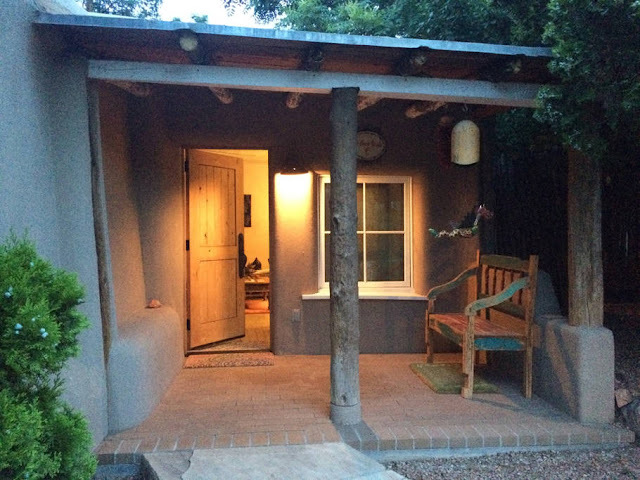 When we recently traveled in the Southwest I realized how much I could be at home in a place like this. The gardens are enchanting and every inch of the house is perfect! 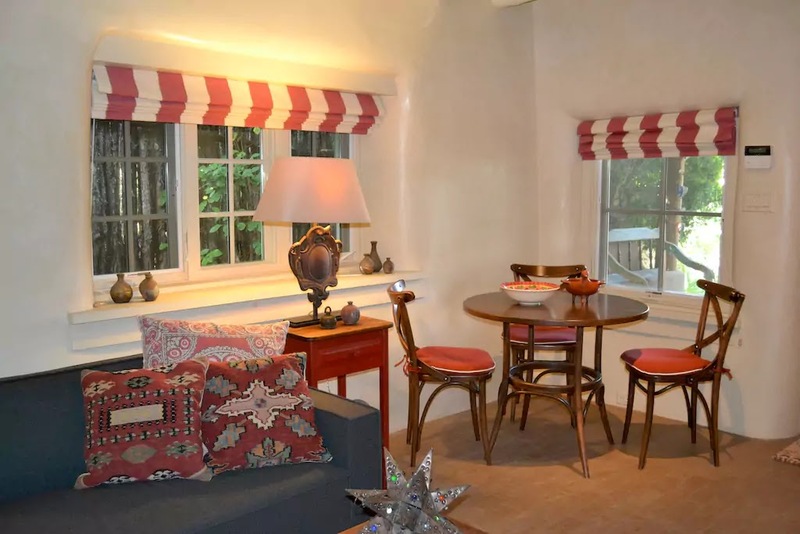 I find this cottage so restful, inside and out. Now I adore other types of cottage styles but this one seems like it would be easy to stay in while exploring the sights. And that kitchen would be a dream to cook in for the times when one didn't eat in the many fabulous restaurants. Sunset time would be a treat each day too. I'd say that people leave at the end of their stay feeling pretty good. 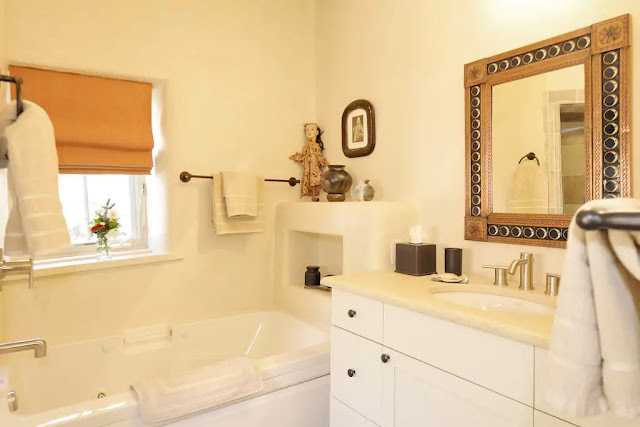 I love the thick walls of this home, and the light color choices for the interior are pleasing; I prefer a cooler climate and cooler colors as well for exteriors of homes, but this cottage truly delivers a load of CHARM! Seeing the entrance reminds me of a very old, historical building in Carmel-by-the-Sea that has been a trendy restaurant for years. No matter what the style, historic, rustic, well-built and loaded with character is always a draw for me! Have a great week, Nancy! What a wonderful adobe home. Lots of character. 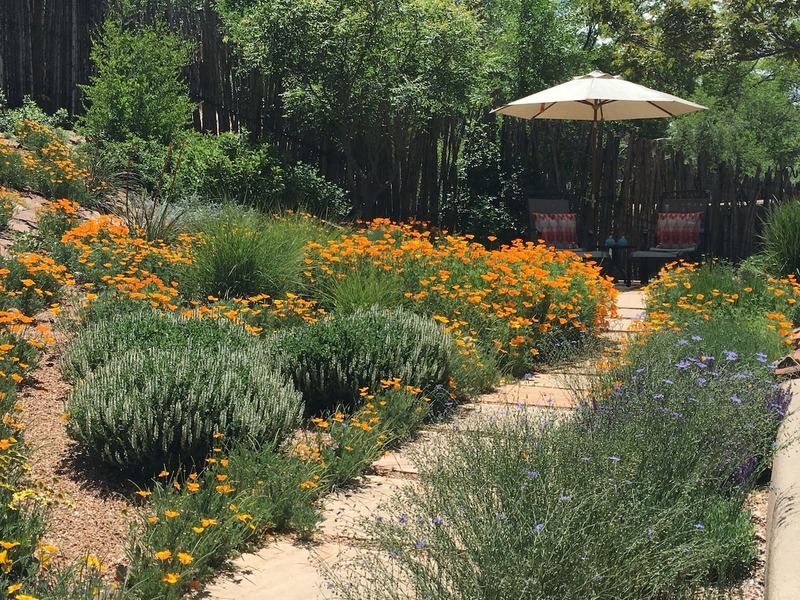 So happy to see Jennifer could find some color to grow in her desert gardens. Happy New Week Nancy. I absolutely love this house. There isn't one thing I would change. Well the TV in the bedroom would have to go. But other than that nothing would change. I have never heard of Mexican mermaids but they are cute and whimsical. 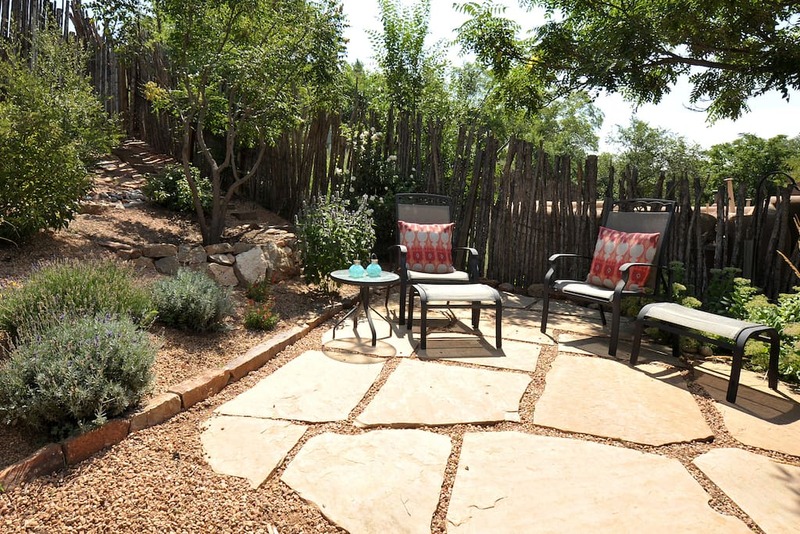 So many patios, how would you chose which one to relax on? Great choice this week. What a fun find Nancy! Thank you for sharing this. The decor is unique for me, I think the mermaids are a very unique find. I enjoyed the garden tour as well. Oh my! I have a dream to go to New Mexico someday. This is exactly what I would envision staying in there. So lovely and looks so big with so much packed in that sweet little home. 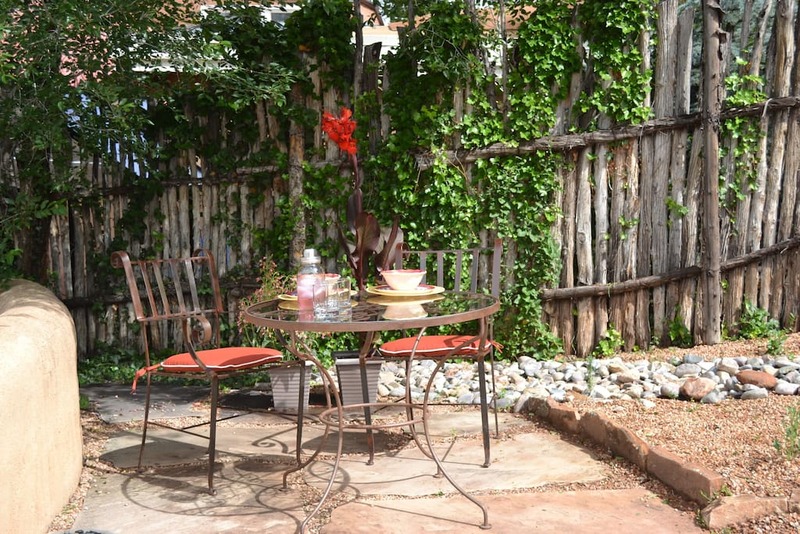 What a lovely little home tucked away in such a darling way, with the cutest upper patio I've ever seen! They certainly have worked with the surroundings and brought such character into the home in so many unique ways. But the outdoor patio had me at the end, it was perfect! Another great share Nancy! From the outside, it looks so secluded. But the inside is so open and airy. Love being surprised like that. Just love this, Nancy. It really is a home I imagine would be in the Southwest, and it's perfect! 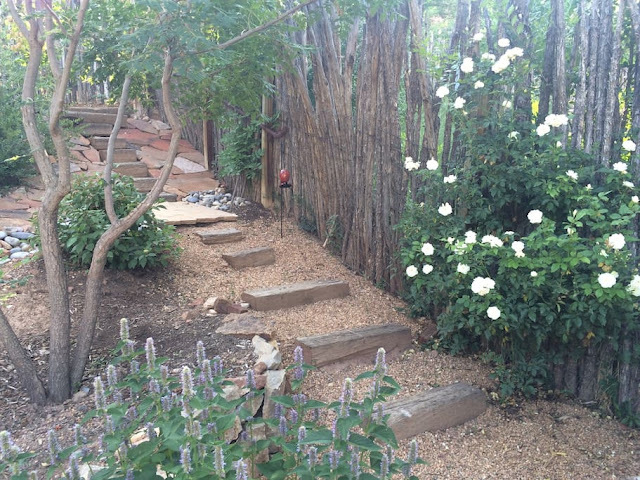 I really love the landscaping, so many pretty flowers! Another beautiful selection, my friend! So cozy and inviting...thank you so much for your faithfulness to share. I SO look forward to these posts! Something so charming for me in the adobe style . . . This cottage looks so warm, comfortable . . . protective. Not sure what it is that gives me that feel. Enjoyed this cottage choice Nancy. 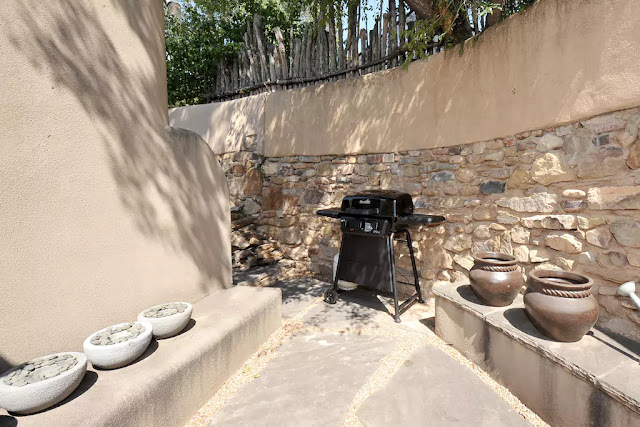 Their garden is such an inspiring space.....it doesn't look like it uses much if any water either which makes it so earthy and functional. Hello all of Nancy's wonderful readers! I want to go back and say something to everyone but I had to put up a group post to ALL of you first to thank you for your lovely comments about our home. And also, to thank Nancy for finding us. We felt so lucky to find the house 4 years ago and creating the garden out of what was a barren hillside threatening to wash away was more fun than any human should get to have (we are very lucky to have a well, which we share with 4 other families, so we have drip irrigation to keep the plants happy). 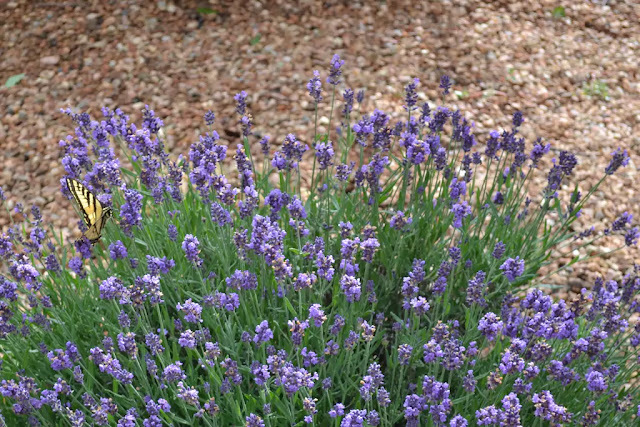 We get hummingbirds (they bathe in the rock fountain), amazing butterflies and are doing our best to help out the bee population; I've cut the lavender a few years running and wrapped it and shipped it to friends. One thing the pictures can't convey is the amazing aroma the house has. Its bones are old, and there is an aromatic, pinon/cedar smell that permeates it. We notice it every time we come, which is never often enough. The way we see it, the home has been there long before us and will be there when we're gone. We're just stewards for it right now. Thank you, thank you. It's an honor to be in such amazing company. This was a very exotic home to me and I really enjoyed this post. Thanks for sharing this great find!